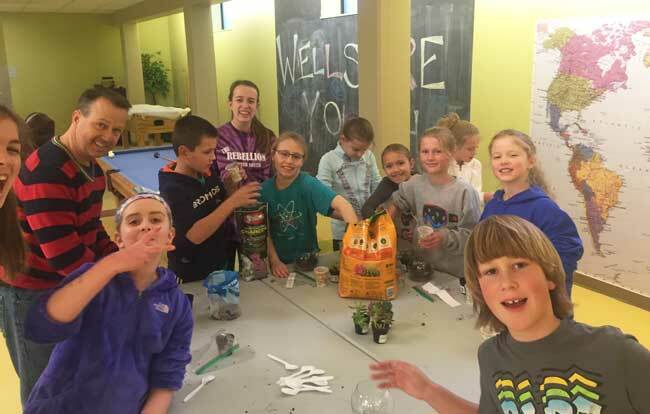 Club 45 is a fellowship program that gives fourth and fifth graders a place to play, laugh, share and grow together. Friends are always welcome! Club 45 was created because we believe pre-teens are walking in-between childhood and adolescence. It’s a time that needs to be honored, respected and nurtured. Kids in this stage need a safe place to be goofy and ask tough questions; a place to play and pray; and a place to see examples of older youth and caring adults who are living out their faith and having fun. Club 45 does not use a set curriculum. Instead, the program combines activities, games, discussions and events, so kids can discover who they are, what they think, how to be a better friend, and how to accept others and themselves. Genuinely be who they are: children becoming adolescents! Participate in a special youth group experience that helps prepare them to participate in our middle school youth group. Find a place to belong that is accepting, caring and fun. Generally, Club 45 meets once a month on Sunday evenings, and there is no sign-up required to participate. Special activities may take place at other times, and in these instances, registration may be required. See our events calendar for dates, times and details. If you have questions about Club 45 or our Family Ties fellowship group, please contact Kendal Mullins.